History is an interesting subject, if only we know how to get kids interested. Trying to help us with this task is developer Quelle Histoire, which creates interactive educational apps focused on historic figures and events. We previously wrote about their work on the blog; first about their take on the greek hero Odysseus, then about their D-Day app. Today, we have their latest app, Cleopatra for kids, which recounts the infamous Egyptian queen’s life in 10 illustrated scenes. Although not fairly long, Cleopatra for kids highlight the important events in Cleopatra’s life. Kids will follow her from her early years in the palace of Alexandria to her meeting with her great love Mark Anthony, and finally to her tragic demise. The entire story is narrated, with the option to bring up the text if kids would like to read by themselves. Each page also contains an interactive map that details the important places in the story, plus a mini game inspired by classic mechanics like puzzle and spot-the-difference. 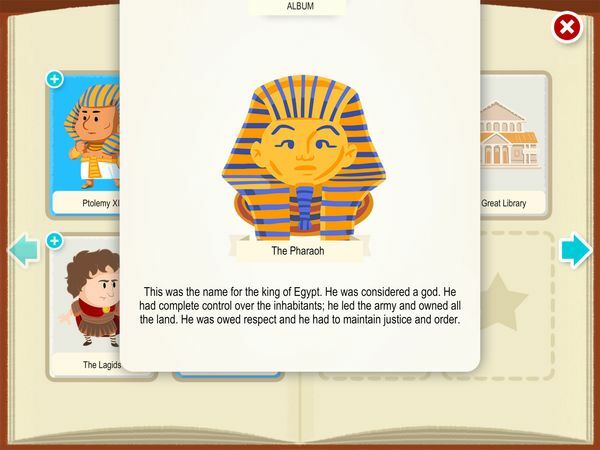 When these games are completed, kids can collect picture cards of the figures and objects related to the Cleopatra’s time, for example, the Pharaoh and the papyrus. These picture cards provide an extra layer of information that may not be covered in the story. There are up to 30 cards to collect. The story of Cleopatra is about politics, love affairs, and power struggles. While the app handles these mature topics well, there are parts of the story that may not be suitable for young kids. I would recommend the app for ages seven and up. Parents also need to know that the app does not contain ads and in-app purchases. But when you first open the app, it will prompt you to sign up for the developer’s newsletter. Including English, the app is available in 11 languages: French, Spanish, German, Russian, Italian, Dutch, Portuguese, Korean, Japanese, and Chinese. History has never been my strongest subject, but I have to admit that Quelle Histoire apps help make it more interesting. It’s the combination of cute, super deformed characters and to-the-point narrative that draw me in. I also enjoy collecting and reading the profile cards. The challenges certainly make the app more engaging overall, even if they do not offer anything new in terms of game mechanics. Some challenges can also be replayed many times as they contain random elements. For example, one challenge has kids navigating Cleopatra through a maze with random exits. 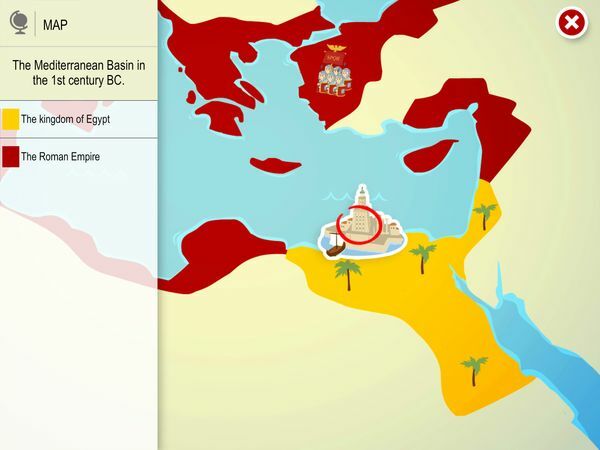 Cleopatra for kids make learning history a breeze through illustrated scenes completed with interactive maps. Various challenges keep kids engaged and allow them to discover historical items by collecting fact cards. Fully narrated and available in 11 languages, the app is accessible by kids ages seven and up.